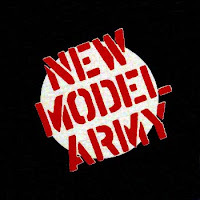 Several years ago, a promoter contacted my band to open for New Model Army. I had heard of them for years, but wasn't too familiar with their music. So after we finished our set at The Mason Jar in Phoenix, I went out into the crowd... NMA started their first song and my jaw just hit the floor. I had never been so blown away by a band in a live setting, that I had never listened to before. Frontman Justin Sullivan was so intense, with a pure sincerity to what he was singing about. By the end of the show, my brother and I were right up against the stage - completely won over. That same night their manager, Tommy Tee, walked over and handed me a $10 bill for an Audra CD. Sadly, Tommy, who was with the band since their beginning in the early 80s, passed away in 2008. We've been fortunate to play with NMA a couple of times since. They are truly a great band. 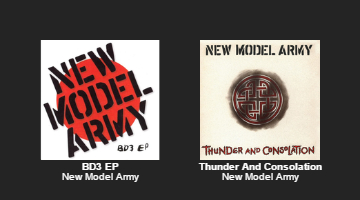 I'm guessing that many of you out there haven't heard of New Model Army. Below is my mixtape for you - of what I think are their 20 Best Songs. Click on any of the links to purchase a song/album - or scroll down for a Spotify playlist.